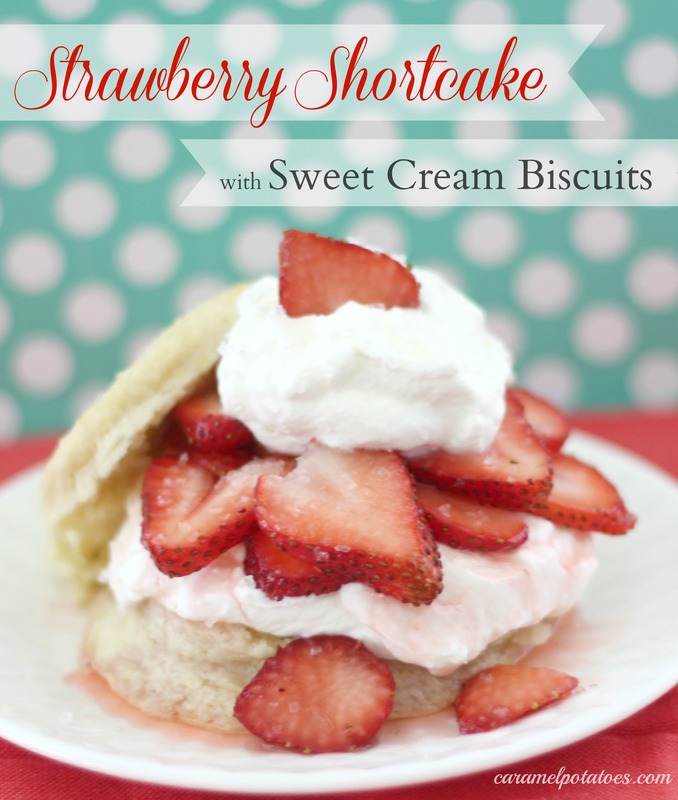 This Sweet Cream biscuit is the ultimate for Strawberry Shortcake; it is light as a feather, with just enough sugar to make it sweet, plus a hint of lemon – pile on the whipped cream and berries and grab a fork! Sprinkle the strawberries with sugar and set aside to macerate. Turn the biscuit out onto a lightly floured surface and gently form into an 8×8 square (about 1 in thick). Cut the dough into 9 (2 1/2 in) circles or just cut into 9 squares. Place the biscuits on prepared baking sheet 2-3 inches apart. Brush with the melted butter and generously sprinkle with sugar. Bake about 10 minutes, or until just starting to turn brown. Remove from oven and allow to cool. When ready to serve, whip the cream, adding the powdered sugar, until stiff peak form. 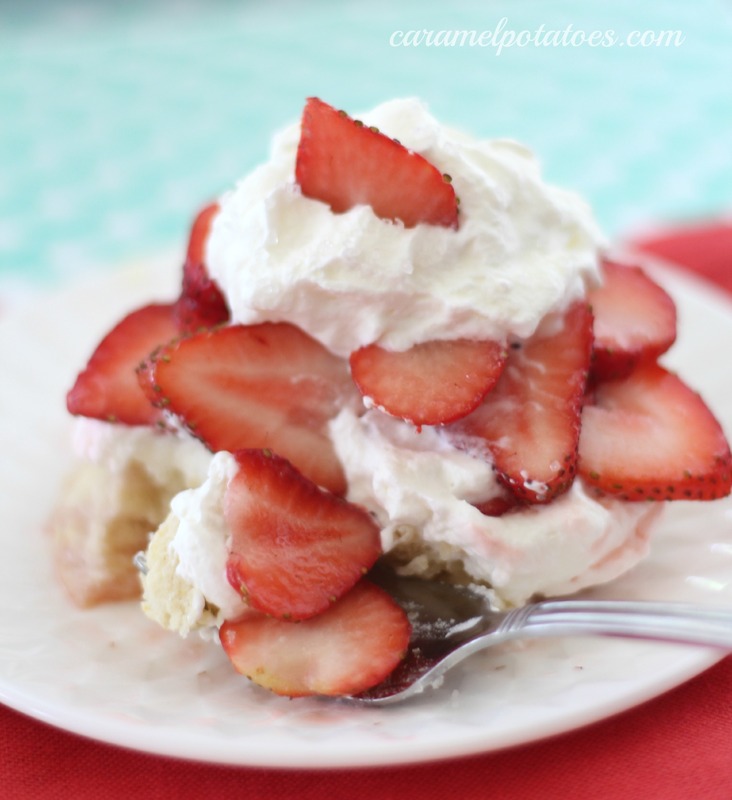 To assemble the Strawberry Shortcake, split biscuit with a sharp knife.. Top with strawberries and whipped cream. Serve top of biscuit to the side or on top the strawberries and cream. NOTE: The biscuits can be made ahead, even the day before and kept in an air-tight container. Okay I thought of the doll first- only because she was always one of my favorites. But I am really hungry and this looks so good right now! Of course the doll. But I do like strawberry shortcake with biscuits not cake! My first thought went to the doll, but now I’m craving shortcake bad. Good thing strawberries are on sale this week! O my! This looks so amazing and reminds me of my childhood! I can’t wait to try this! Thanks foe linking up with us this week! Looks absolutely perfect! Great photos! Thanks for sharing at Sweet & Savory Saturdays #19!